As discussed by the American Academy of Family Physicians, a food allergy is an adverse reaction to food that is mediated by the immune system. Almonds, a type of tree nut, are one of the most common triggers, along with eggs, milk, soy, wheat, peanuts, fish and shellfish. Food allergy in infants can be particularly difficult to detect, because an infant is unable to express discomfort or explain symptoms. An allergy to almonds first develops when an infant is fed a food product with almonds in it and forms immunoglobulin E, or IgE, in response to the almonds. IgE is a type of protein that mediates allergic reactions. When the infant encounters almonds again, the IgE responds to the protein in the almonds and releases inflammatory chemicals that cause an allergic reaction. While infants are not typically fed almonds directly, almonds can be found in numerous other foods, including salads, salad dressings, sauces, breading on meat, pancakes, vegetarian burgers, pasta, fish dishes, pie crust and seasonings. The most obvious symptoms of an almond allergy in infants involve skin manifestations of allergy. These include reactions such as hives, redness of the skin or swelling. Sneezing, coughing, wheezing and appearing to have difficulty breathing are signs the allergic reaction is progressing. An infant may also vomit, though this may be more difficult to detect if the infant commonly spits up after meals. The baby's cry may sound more high-pitched or the tone of the infant's voice may change. This is a sign the airway is constricted as part of the allergic reaction. While only one or many of these symptoms can occur, the reaction typically happens minutes to an hour after exposure to almonds. Infants are at the highest risk for developing almond allergy symptoms, because food allergies are most common in infants and toddlers. Other allergies, such as to peanuts, other tree nuts, milk, soy or eggs, also make it more likely an infant will have symptoms of almond allergy. Additionally, having a family member with allergies or having eczema puts an infant at higher risk of developing an almond allergy. A careful description of the symptoms and the timeline of the infant's symptoms can help a doctor determine whether it is likely an almond allergy is present. If the concern for this allergy is high, skin prick testing can be performed for diagnosis. In this test, a small amount of almond allergen extract is scratched onto the surface of the skin using a plastic device. After 20 minutes, the reaction of the skin to the allergen is measured. Blood testing can be performed as well to measure the level of IgE to almonds. 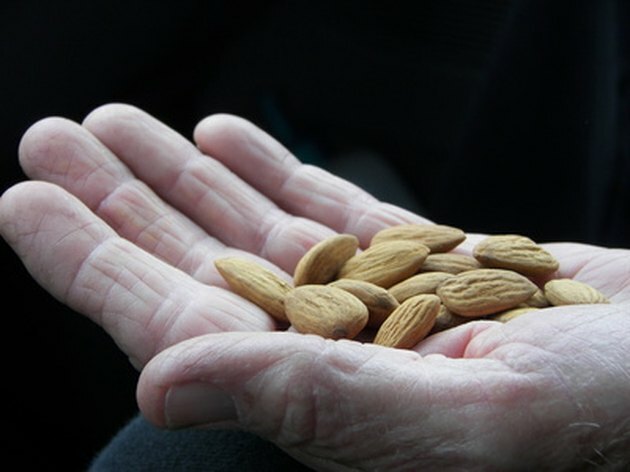 The symptoms of an allergy to almonds can range from bothersome to life-threatening. Even if the initial reaction is mild, it is important to remember a future reaction could be life-threatening. The first step in treatment is complete avoidance of almonds, including almonds in other food substances. This requires careful reading of food labels. Some pediatricians may recommend an infant not be introduced to other potentially allergenic foods until a later age, but this should be discussed with an infant's own doctor. Additionally, injectable epinephrine in an infant's dosage may be prescribed for use in the event of a reaction from accidental exposure.